I’m okay… I’m okay.. I’m okAYCARMAGEDDONNNNNN!!!!!! Isn’t it obvious? I’m revved up with excitement, and I apologise for that unexpected pun too. I’ll confess, not only was I excited to see this game finally come out for the iOS, when I saw the announcement trailer, I so much so punched the air with excitement! This is the same reaction I gave back in 1997 on the week the game was available in Australia, uncensored I might add! I was 16, I saved up enough to get this game for AU$80.00 at Virgin mega store in Myer Centre Adelaide. I only had a 486, yet was glad to find the game still worked nicely on it! I got hooked, and couldn’t let go of that game, even when I played the game before my driving lessons (and for the record I didn’t run over any pedestrians). Before I continue, I should note that this review will contain images of graphic violence that may offend readers. You’ve been warned! Fast forwarding to early 2012 and the rumors and hints of a reboot to the franchise got my mouth frothing yet cautious at the same time. I should add that yes I owned Carmageddon 2 and sadly that didn’t rock my world as much as the first one did, and don’t get me started with Carmageddon: TDR2000 either. No, lets erase that thought of TDR2000 and just think about the game that started it all. 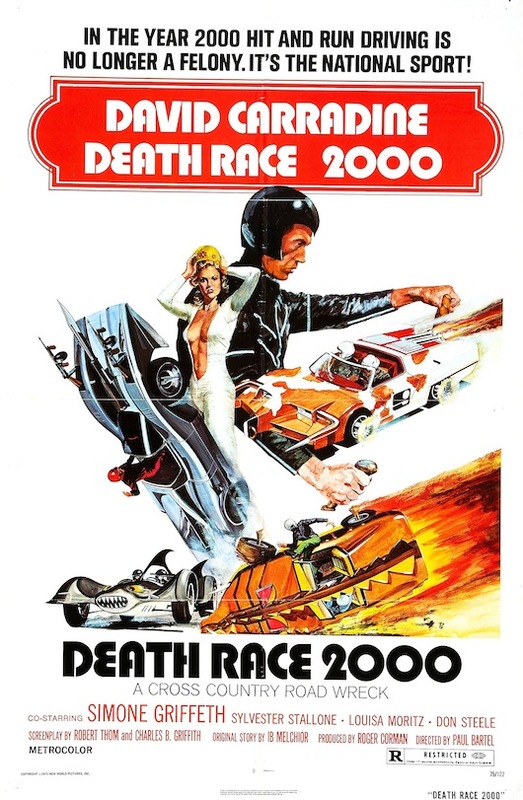 But where did the idea of racing in meaty looking vehicles whilst running over pedestrians come from? 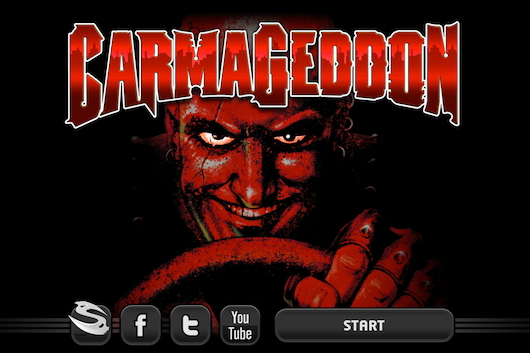 Carmageddon is highly controversial racing game with no set storyline, just race through over 36 enormous sandbox stages, meaning you drive anywhere you want, and go off-course if you wish. 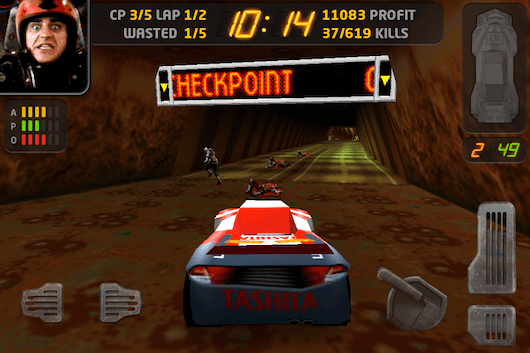 You also have the freedom to finish each stage in many ways, either by racing through each checkpoint, smashing up other opponents or flatten every pedestrian in the game. You probably have figured out by now why it’s controversial as well. Yes you can run over pedestrians, and cows as well as being able to squish over their corpses and lose enough traction from the blood to lay some red burnouts or doughnuts but you would have to run over pedestrians to get more time on your clock as well as credit to repair or recover or upgrade your vehicle of choice. It is to be expected that a game like this would be overlooked due to the gimmick of running over pedestrians, but in all honesty, this is a good game. 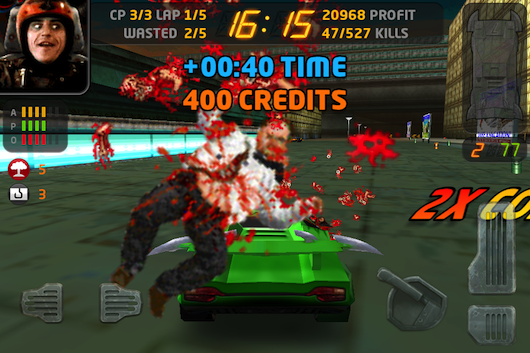 Having the pedestrians in the game makes it part of what Carmageddon is all about. 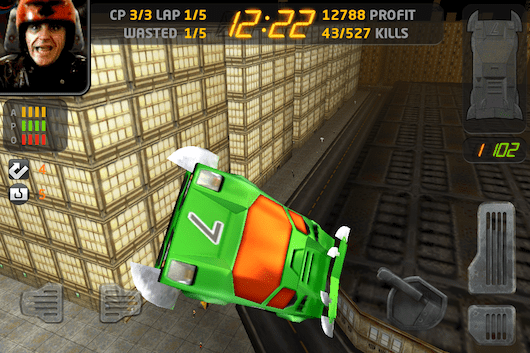 The crazy physics is another key aspect that delivers the right dimension of fun in a racing game like this. 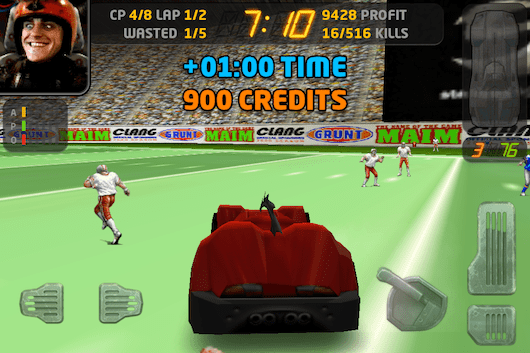 The plethora of power-ups and power-downs through out each level adds extra challenges and carnage like having instant handbrake, jelly suspension, pinball mode which bounces your car around in a momentum that the harder the car hits the wall, the further it will bounce in the opposite direction. Too many power-ups to list and the ones mentioned are just some of many! Considering that the game came out in 1997, the graphics and vehicle physics in the game were quite ahead of it’s time. Considering that you can repair your vehicle on the fly and you get to watch your car un-crush itself from the destructive pose it was in. 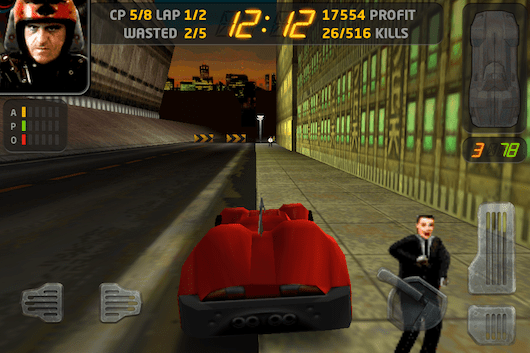 I’m glad that the re-release of Carmageddon for the iOS got the improved controls, interface enhancements and touched up graphics without moving too far from what made the original look and sound what it did long ago. And the sound in the game? Oh dear, I’ll say that it’s quite corny but a corn that I appreciate and love. The ‘crowd’ cheer from the game developers cracked me up when you won a race. Voice-overs of the drivers (Either drive as Max Damage or Die Anna) are hilarious, as are their facial reactions depending on the situation in-game. How about the music? If I had to pick 3 of my favourite metal bands of all time, I would have to go with Sepultura, Ministry, and Fear Factory (when Rhys Fulber and Raymond Herrera were still in the band). The soundtrack is quite minimal, mainly instrumentals of the more well-known tunes from Fear Factory’s classic Demanufacture and some industrial/electronica-inspired tracks thrown in by other composers. So how does it play on the iOS? Pretty damn well! Typical thing to find in an iOS game is the choice to unlock all the cars or maps if you can’t be bothered to race through them and experience the challenges awaiting you. Personally, that is the fun part, especially manually unlocking the cars by smashing up other opponents on the road enough times throughout the game. I had concerns that the game would be quite unplayable with the touch screen interface, and I’m glad to be wrong here! There’s a couple of different control methods, either digital, analog or tilt. In game you touch and slide parts of the screen to get access to either the map, instant replay editor, and main menu. However there are a couple of flaws in the game I need to bring up. Firstly with the fact that you can slide and touch all over the screen to load different things, it can get in the way when you’re in intense moments of the game whilst using say the digital controls. For a retrospective there was a serious bug that wiped your save game progress. It’s happened to me, but luckily I was only 6-7 stages in. Mind you, the version that I reviewed was the very first one that hit the App Store and by the time you read this review, there is an updated version on the App Store which fixes that issue!! 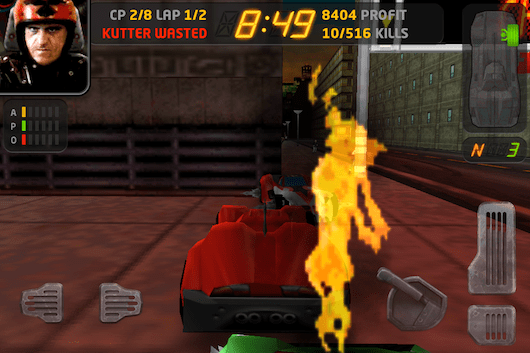 Carmageddon for the iOS is a lot of fun, I repeat A LOT OF FUN! I think Stainless did an amazing job of re-releasing a unique kind of game on to a unique kind of game platform and doing it right at the same time. It’s not flawless, but the positives clearly outweigh the flaws. It is an absolute bargain when the game first came on to the App Store at no cost for the first 24 hours, and still extremely good value at its current price (around AU$1.99).